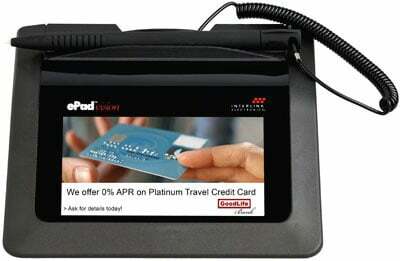 ePad Vision not only captures secure, legally-binding esignatures, its large, full-color LCD screen enables you to display unique visual images and text that attract attention and help your customer-facing representatives cross-sell products and services. Additinally, dynamic functionality lets you display targeted marketing messages and colorful images, personalize your backgrounds, conduct customer surveys, have signers scroll through compliance text, and more. Selectable onscreen check boxes and response buttons enable you to obtain important customer information, and make it easy for customers to opt-in to special offers.